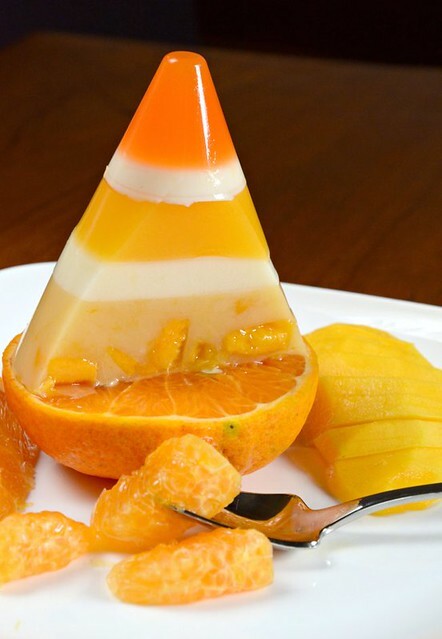 "An orange a day keeps the doctor away"
Traffic Cone Jelly: Alternating layers of pure fresh mandarin orange juice jelly and evaporated milk, ending with a gorgeous layer of mango puree and mango cubes cream jelly sitting on half a mandarin orange. We were at my son's school last week when my daughter, who was back for a short holiday, pointed at a traffic cone (I assume that's what they are called) and said "Look, a cone, like those Jelliriffic! jelly cones." I made two jellies today and was just about to post the other jelly when I suddenly decided that it could be better. I was impatient and didn't wait to thoroughly melt the jelly. I cooked the full amount and re-heated the amount as needed. The jelly was cloudy. All those precious berries...I will have to type this post (10:45 pm now!) asap. 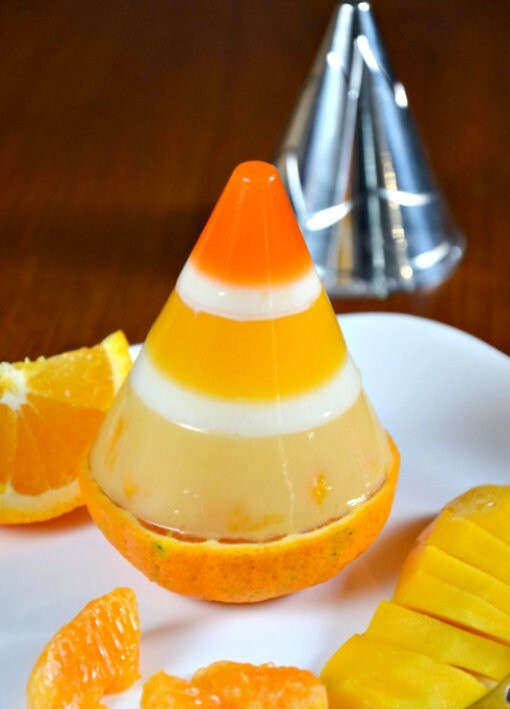 So this was a jelly that was inspired by a traffic cone, of all things. I was going to make the whole jelly with mangoes from my in-laws' but I wasn't sure if I could get a clear layer with mango so I looked into my fridge and saw mandarin oranges and oranges and that's how this jelly came about. I started with an orange but the color was too pale so I used a mandarin orange instead. Surprisingly, this is one of the best jellies I've made so far! The mandarin oranges and the mango went well together. I LOVE mangoes and anything with mangoes just tastes heavenly. The pure mandarin orange juice too was refreshing and sweet. Am SO happy with this jelly! Btw, if you like jelly oranges, check out this recipe too. Kids and lazy chewers love it. Some trivia just to stress myself even more as the clock ticks away (do people have ticking clocks these days?). Question: Where did oranges originate from? Wrong, not Israel and certainly not South Africa. Oranges are originally from Southeast Asia although some botanists say they are probably from China. We have a local green-skin orange in Sabah that's very juicy but it seems to have gone extinct. Next. What color are black boxes? Wrong again, they are orange. Black boxes used to be black but now, orange is the color for flight data recorders because orange is the most easily seen color by the human eye, especially in dark places such as jungles and the deep blue sea. And this one: What is a mandarin? You better brush up because you're wrong again. A mandarin is a Chinese court official in ancient times. A mandarin orange is what you eat. Okay, I better type to the recipe and post soon. The Internet service has been erratic lately. Psst! Have you ordered your Nick Munro moulds? Order one and get to vote for your favorite blogger! You get a chance to win an Olympus PEN-Lite PL3 camera too and best of all, the money goes to the Breast Cancer Welfare Association to help women with breast cancer. Mandarin orange, orange and mangoes to serve. Those are very ripe mango cubes, bottom layer. -- Scatter sugar and agar powder (or mix first) over the juice and heat, stirring, until sugar and agar are dissolved. Pour into a rinsed Nick Munro jelly mould. --Heat everything together until sugar and agar are dissolved. Pour (when still very hot) less than half onto the previous layer. --Do same as the tip layer. --When still very hot. pour onto the previous layer. If the remaining white jelly has set, re-heat it until fully melted and pour over trhe previous layer. 1) Heat and dissolve the agar, sugar and milk as above. Remove from heat and add the mango pulp, stirring well. Sieve over the previous layer and drop in the mango cubes. Cool and chill well before serving with extra mango and mandarin orange/oranges. Very beautiful and interesting jelly! I love the layers and of course a citrus fruits fan, I am sure this is going to be yummy! Congratulations! You have just made your readers so proud of you, this is just so original and just so you! Your best creation so far or may i say in this challenge too? love where you get your ideas from :D jelly looks amazing! Terri, so sharp and look like come and eat me now! you are super. guess all the mothers are going to give the cones soon. Love the colours and it sure taste refreshing! hahaha love this!! you should make a few more and get a plastic toy truck and use that as a prop! LOVE the colour sequence from dark to lighter hue, separated by a clean white layer in between. I like how they look similar in colour but totally different in flavour (one orange one mango). Have to make this lah! This is a simple idea but executed very well. Sometimes, simplicity could be the key. Cheering you on..
Lovely colors, I'm sure it tastes great! Oh I missed this ...gorgeous ...love colors ...so my thing ! the colour and layering look so beautiful!! yup..yup..perfect for summer! 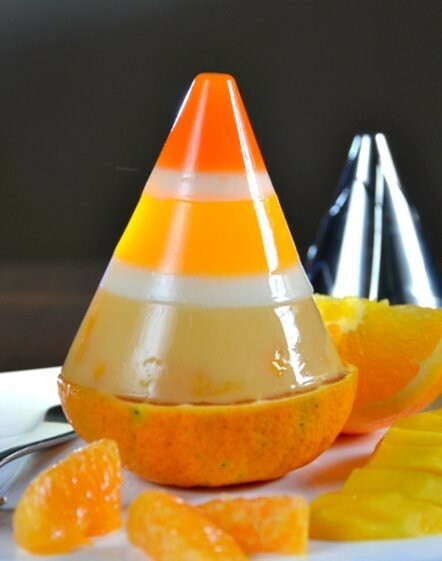 WOW so Amazing Refreshing beautiful colours road cones Recipe yummmy...!! Nice Blog Post,Temporary Reseal markers provide immediate and cost effective delineation for both day and night and easy identification of the original line markings during resealing.